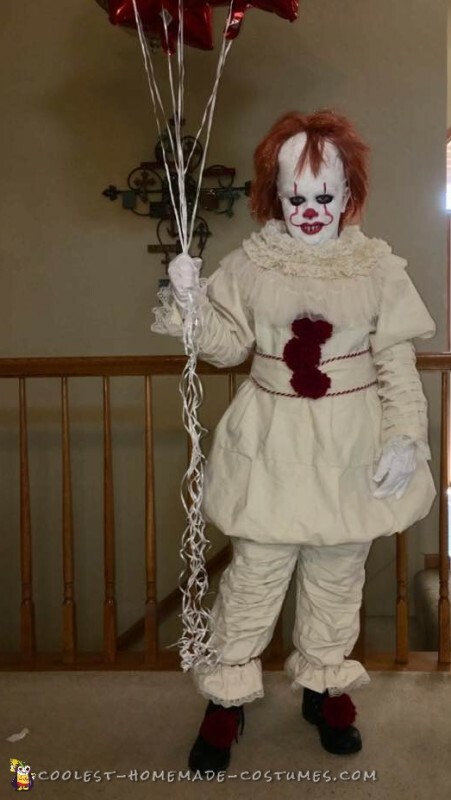 My beautiful daughter asked me to create a Pennywise 2017 Costume. You are kidding right? Yes I can sew; yes I have a sewing machine, not without a pattern. After many hours of searching for a pattern I had zero luck! Please Mom can you try? Sure honey let me see what I can do. I found a simple tank top and shorts pattern at Wal-Mart for like 97 cents. Okay this is cool, no worries right. HAHAHA! 10 yards of some off white kind of material for 1.50 a yard woooohooo plenty to mess with for sure. I used the entire 10 yards with many mistakes and do over’s. 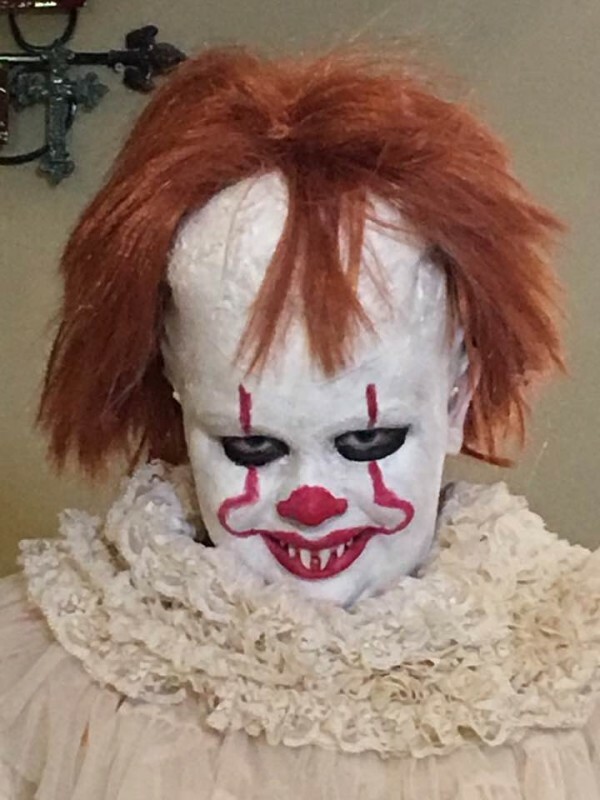 Pennywise is like something from the 1870’s I have no idea how to do this. 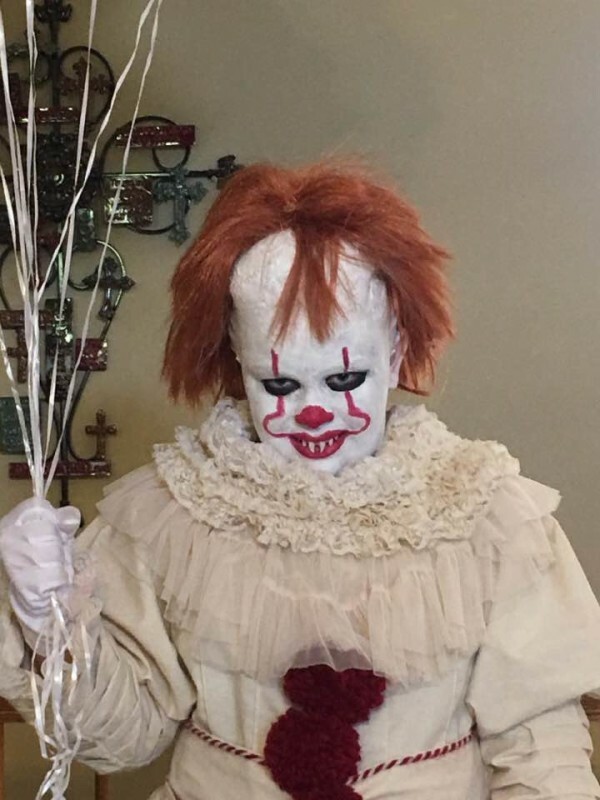 You tube for hours trying to find something to help me recreate this creepy clown! Finally I started sewing and each little part just came together. The pants, then the body, arms and the Neck piece. The neck piece is actually a little skirt that my small niece was wearing one day and I asked if I could buy it from my Sister. Yep it worked after soaking in some bleach then coffee. Still wasn’t satisfied with the neck so I purchased a pair of undergarment frilly shorts from the Halloween store for $4 (on sale)…ripped the crouch, soaked in coffee, woohoo frilly neck piece. The boots were the most expensive part $19.99. That wasn’t a biggie because after removing the Red puffs she can wear them the rest of the year for school. So off she goes to the local Pumpkin Festival to be in the parade. SHE LOVED EVERY MINUTE of it. She won first place in her age Group 8-12 and overall grand Prize winner for BEST Costume. Everyone wanted a picture with her and she was just awesome. It took me about 2 weeks to complete the outfit and was worth every minute I spent on it.